The first project highlighted as a conservation priority in the Deschutes County Greenprint and successfully conserved as a new public park is Miller's Landing, in the heart of Bend. For years, Miller's Landing has been used by locals as open space to walk dogs and access the river to swim, fish, and boat—but the land was, in fact the private property of the Miller family, and had been for 85 years. But after 60 years as open space, it is as much a part of the town's riverfront greenway as McKay Park, which lies across the river. A symbol of Bend's history, the property was the original lumberyard for the Brooks-Scanlon mill. More recently, the land was considered for the development of 37 townhomes. In 2010 the Miller family and Brooks Resources Corporation, partners in Millbrook LLC, agreed to work with The Trust for Public Land and turn Miller's Landing into a community park if we could raise the $1.8 million purchase price in under a year. On December 19, 2010, The Trust for Public Land announced the successful purchase of the property. 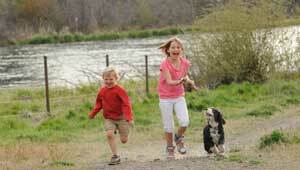 Now, Miller's Landing will be added to the Bend Park and Recreation District and integrated into their community park river system as part of the popular Deschutes River Trail. If you have questions or comments on these concepts, or would like receive updates on the Miller's Landing planning process, contact millers@bendparksandrec.org.